Following is the second part of an article I was asked to write for a tire industry trade publication in the UK. “Tyres International.” I thought you might find it a bit interesting. “To the untrained eye it might seem like the tire industry has not done much to improve John Dunlop's original. But looks can be deceiving. A cost/performance comparison on the improvements in wet and snow traction, ride comfort, low noise, blowout resistance and handling response is significantly more difficult, as the tire of 1920 was so poor in many of these areas as to be considered useless when compared to today's tire. When one considers high-speed capability it is a little easier. In 1920 most cars were not capable of a sustained 85mph, yet today that is considered an absolute minimum high speed capability for a tire to be sold for use on the public highway. Some would have us believe that today's tire engineer is not willing or even encouraged to look at new ideas or materials. Even the use of rubber, both natural and synthetic is used as an example of the perceived lack of advancement in tire technology. The basic material in Mr. Dunlop's tire, natural rubber, comprises less than 10 per cent of today's modem passenger radial. Today's tire, with 25-30 different materials, made up of hundreds of different chemicals, is one of the more complex components in a modem automobile. This is especially surprising when you consider that some materials are considered contaminants and are incompatible with other materials in a tire yet we have managed to make these incompatible materials work together to deliver improved air retention and blow- out resistance. It is likely the concept that tire materials have not changed is a concept only held by those with little training in the an of tire design. There are few materials that are capable of 300 per cent strain for tens of millions of cycles over an operating range of temperatures from -20°F to +200°F while at the same time having a coefficient of friction of 0.8 or higher. Today's steel belted radial could be improved upon and even have its weight lowered, with increased use of rayon, fiberglass or other materials as belt material. There are however, restrictions on pollution or customer resistance to materials other than steel which have so far proven insurmountable obstacles to broad appeal for the average consumer. Some of our biggest challenges will come in the next decade as we are asked to change from making a product that will last indefinitely under extreme conditions as the tire industry has been asked to do for more than a hundred years. We are now being asked to design a product that will be almost indestructible until the user wants to change it, then the tire should, as if by magic, become easy and inexpensive to deconstruct into its chemical components. Some OEMs are even starting to suggest that old tires should be able to be recycled into new tires with no loss in any performance characteristic. I have every confidence that the tire industry will rise to this new challenge and methods will be developed to address the disposal and reuse of materials in a tire. It is unlikely the recycled materials will be used 100 per cent in another tire just as the OEM will not be able to recycle the leather car seat into a good as new' leather car seat, but we will incorporate an ever increasing percentage of recycled materials in tires and we will find acceptable methods of recycling them into some usable material or product at the end of their useful life as a normal tire. To the uninitiated it is easy to look at John Dunlop's tire of the late 1800s and say that since today's tire is still made of "rubber' it is not really any different. Thus some would consider this sufficient proof to postulate the tire industry is not capable of looking at history, learning from it and moving on. It is my belief that this thinking ignores the advancements in both the materials and performance delivered at a very low cost to the often uncaring consumer. Following is an article I was asked to write for a tire industry trade publication in the UK. “Tyres International.” I thought you might find it a bit interesting. Many people think the tires on their car are just a necessary evil. Most seldom, if ever check their inflation while alignment is something few ever consider. Then after 40,000 miles, they complain about the fact they have to buy new tires. Even within the automotive industry, there are those who don't appreciate the dynamic nature of tire design, and the significant improvements and changes made since John Dunlop invented the forerunner of today's modem tire. There are many challenges facing the tire engineer today, but one of the most challenging is to make continual improvements in rolling resistance. In North America, the Original Equipment Manufacturers, otherwise known as "Detroit", demand the improvement or lowering of the rolling resistance value of the tires they approve. The rolling resistance of tires has a direct impact on the fuel economy of the vehicle. Many would think the primary reason for an interest in rolling resistance would be to allow the manufacturer to advertise good gas mileage for their vehicles. While good fuel economy is something that can be advertised, a more concrete example of why this is a major concern of the OEM is the avoidance of what is known as the "Fuel Guzzler Tax". This tax can amount to many tens of millions of dollars as the OEM must pay for each 0.10 mpg their vehicles are over a government mandated rating. There is some data that shows that a one per cent reduction in rolling resistance could be worth US$60 million on certain car lines. Despite this major interest by Detroit, I have never been asked about the rolling resistance of a brand or line of tires by any individual considering the purchase of a set of tires. Significant strides have been made in improving the rolling resistance of tires going to Detroit. Figure 1 shows the trend as well as the ultimate value possible with a steel wheel on steel rail. It is obvious to see the majority of improvements have already been made and while we may expect some level of continual improvement, we will not see the dramatic improvements of the past 20 years continue in the future. 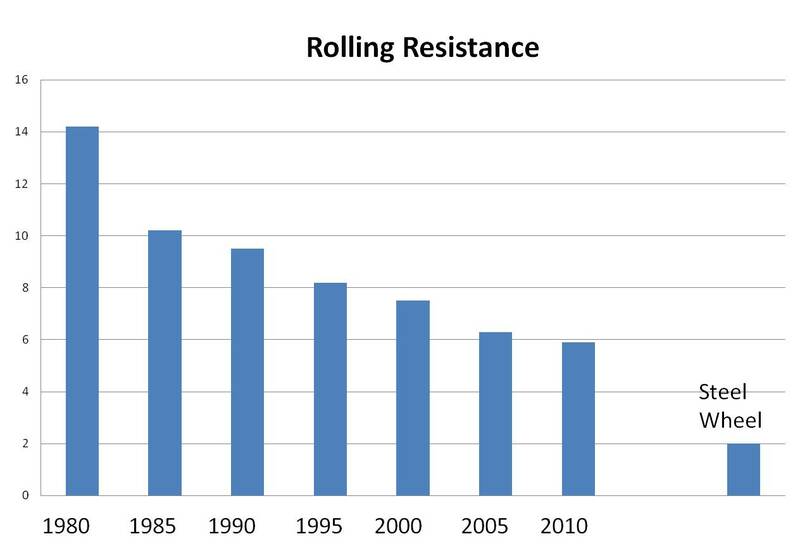 RRC or Rolling Resistance Coefficient is one way of comparing a variety of sizes and adjusting for vehicle load as well. At the same time as these improvements have been made and despite great strides in ride quality, crisper handling, improved snow and wet traction and other various measures of performance, Detroit also expects us to lower our price a few per cent each and every year. The fact that many people are willing to spend more for shoes, simply because some athlete wears the same brand, than they are willing to spend on a tire points out the level of disdain and disinterest most feel toward tires. Seldom does a driver consider that it is the tires that must deliver strong performance in emergencies to help protect them and their family from harm. We will conclude this article in the next post. 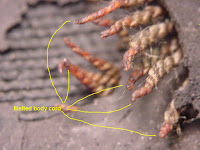 A person mentioned that both rear duals tires got hot due to air loss and subsequent overload. One tire was identified with a leaking valve and was replaced but there was no suggestion that its mate might have also suffered internal structural damage from running hundreds to thousand miles in an overload condition. Few tire dealer salespeople or even tire technicians have the training to see the tell tale signs of overload. Here is a picture I call "Shades of Black". We know the tire in the picture was run overloaded as it had an improper repair (plug) and had continued to slowly leak air for many hundreds of miles. By "reading" a tire when doing a true forensic level examination the experienced tire engineer will notice the darker inner sidewall portion of the tire. This darker shading comes from increased level of flexing that can occur when run in overload or under inflated condition. The darker black is physical proof that the subject tire had been operated for many miles while under significant overload. 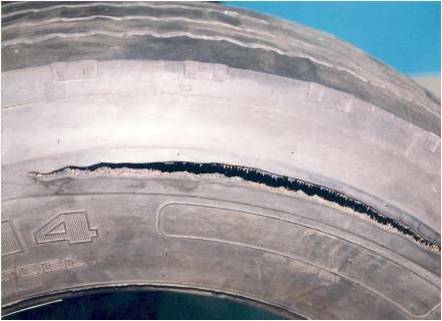 This operation resulted in degradation and weakening of the tire's structure which meant that in all probability, it could fail catastrophically with little or no warning hundreds or thousands of miles later. This type of structural weakening is not visible from the outside and is difficult to see even with a proper inspection of the inside of the tire which takes more than the few seconds most tire techs are given to do an inspection. I don't expect the magazine writer to know this but when responding to complaints about tires I strongly suggested that they touch base with tire technical resources and to provide a little education to readers. When one tire in a set of duals is run "flat" i.e. more than 20% under inflated, it means the mate was also operated in an overload condition. Unless there are some special circumstances, the operator seldom knows how many miles, at what speed, at what % overloaded the tire was operated. Only the most experienced tire engineer and not tire store personnel, have the training necessary to pass judgment of the probable condition of the tire. Many times the mate to the "failed" tire should also be replaced or retained as a spare for temporary use. Failing to warn readers of this potential safety issue is not a good policy. These four videos were just released by Goodyear. The info in these videos is good to know and follow. Even though this information is posted by Goodyear I strongly suggest you follow the advice given as sound technical advice is good to follow no matter who is the messenger. I can only guess at what your questions might be about. If you want to know something about tires post it as a comment here and I will make a list of topics to cover. No guarantee, but if you don't ask, I may not think of the topic you want to know about. I was recently asked "What do you recommend for high pressure setting with a TPMS?" The person said after driving about 50 miles in 92°F weather he was seeing 148°F on his right front and the left front went to 136°F on his Class A RV. His tire pressure monitoring system (TPMS) has a setting of 158°F for high temp. He wants to know; At what tire temperature should he be concerned when driving? If the TPMS is one of those that screws onto the end of the valve, then it is reading lower than the hottest part of the tire. If he has extension hose on the dual then the temp reading is even lower. I have tried to find a TPMS manufacturer that has data on the temperature difference but so far either they do not answer my email or they haven't bothered to do a test. My information indicates that a properly loaded and inflated Class-A tire will probably see 140°F to 170°F operating temperature and these temperatures are OK as the tire is designed for this temperature range. If you have actual side to side weight and know you are not overloaded, you may see temperatures in the 140 - 170°F range. If you see higher then I would be a bit concerned and want to know why. Setting your TPMS Max warning temp to 158°F sounds reasonable to me. I have seen some posts and comments about tire covers. One post caught my eye. The owner was complaining about the cover degrading in the sun so he was of the opinion the cover wasn't worth the cost. I have to wonder how he failed to properly interpret the proof that the cover was protecting his tires. How would he answer the question: Which would you rather have degrade due to being in the sun? Your tires or the low cost cover? As an Engineer I always prefer to have data rather than just someone's opinion. So I set up a quick test on my own RV. As you can see I have covers for my tires. They were the second purchase after buying my rig. The first was a Tire Pressure Monitor System. With one side of the RV in full shade I checked the temperature of the side of the unit. You can see I recorded 85.1°F. Then I took the temperature of the side of the RV in the full sun. Next the temperature of the white tire cover in full sun. I believe the cover is cooler than the side of the RV because air can circulate behind the cover. I then removed the cover to see what the tire temperature was under it. Only 1 degree hotter than the cover. I then waited 30 minutes to see how hot the black tire got while in full sun. We see the black tire was at 136.1°F. There are three things that can "kill" your tires. Ozone, UV and High Temperature. 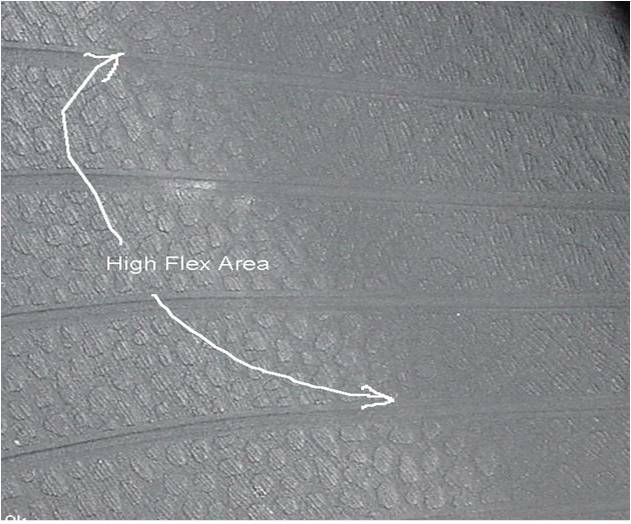 The Ozone & UV directly attack the surface of the tire making it crack when flexed. Temperature works no only on the surface but deep down inside the tire structure. Increased temperature causes continued and accelerated chemical reaction which "ages" a tire faster than when the tire is cool. A rule of thumb would be that the rate a tire ages doubles with every 18°F increase in temperature. We can see the result of old rubber on the surface. What we don't see is the more brittle rubber of the internal tire structure. As rubber gets more brittle with age it also looses strength. 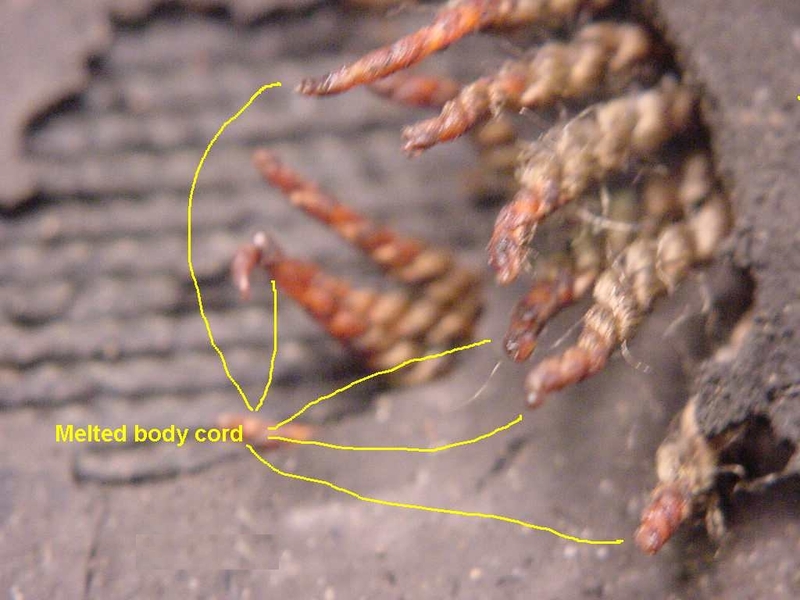 NOTE Overload and Underinflation can overheat a portion of a tire to the point the rubber and reinforcement materials loose all their strength. Based on my simple test it would appear that by covering my tires I am significantly reducing the artificial aging for all the daylight hours my RV is parked and the sun is out. If I didn't have covers my tires would be "aging" FOUR times faster than with the covers in place. I don't have black tire covers so can only guess at their temperature. While they may provide protection from UV I would be surprised if they can offer much temperature protection. So I will let you answer the question of Tire Covers being a good investment or not. I have seen a number of posts on various forums of complaints about what is believed to be a failure of a “defective” tire. What I have not seen is any mention of anyone having bothered to provide details and information on what the defect is and a statement that they send the data to the US Dept Of Transportation. I have to wonder why people think there might be some government action when there is no information going to the government complaining about what they feel is a defective tire. You can review the current tire recall list from the National Highway Traffic Safety Administration HERE. NHTSA is the part of DOT that is responsible for collecting complaint information and doing the appropriate investigation. If there is data developed that would support some action such as a recall, NHTSA is the agency that can order the action. Before a tire might be recalled there is list of “complaints” accumulated and you can review that information HERE. It is important to remember that just because someone may have had a tire failure and complained, that does not automatically mean there will be a recall. 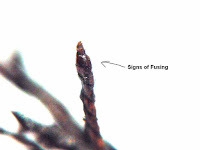 Many times there are contributing reasons for an individual tire to fail. Most of these contributing reasons are not part of a design or manufacturing trend which would affect a group of tires. I can recount how my work as a Quality Investigation Engineer resulted in a recall of 4,900 tires when I discovered what was a manufacturing error. This sounds like a big number but in fact the data we assembled identified there were fewer than 150 tires total that had the problem. The reason the number grew is that tire recalls are done based on DOT serial, which as you know includes the week of production. So even though we were able to confirm the problem was caused by a single skid of material being used in the incorrect part of the tire, the entire weeks production had to be recalled. 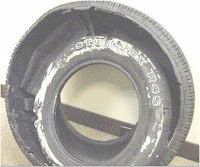 In this case none of the tires had made it to individual customers as the problem was discovered so quickly the tires were either in the warehouse or on vehicles still at dealer lots. The reason I am telling you this is to show how the system works. A problem is discovered. An investigation is done. 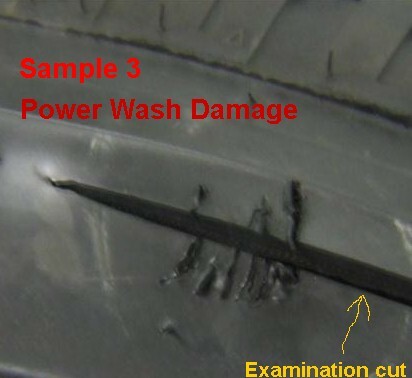 Sometimes by NHTSA based on the complaints received from the field and sometimes by the tire manufacturer with their in house quality department. If tires are to be recalled then the formal procedures and laws must be followed. I have advised a number of people who complain about a tire failure that if they do not file a complaint there is no way there will be a recall or even an investigation. I do note there is a general tendency for many on some RV forums to brand all tire failures as being caused by “defective” tires but based on the pictures I have seen, I remember only one example of the failure that might have been caused by a design or manufacturing problem but since these failures were isolated to a single RV it is more likely the failures were service related. Can I categorically state that there are currently no defective tires in the field? No I cannot. However based on my experience of personally inspecting thousands of tires identified as "defective" by self proclaimed experts, the facts are that most tires fail because they are under inflated, overloaded, improperly repaired or suffered a road hazard, impact or even vandalism. On a personal note I have to wonder why so many in the RV field are quick to blame a tire failure on the country of origin, tire manufacturer or complain when tires need replacing after many years of service and some abuse, while at the same time are willing to spend many tens or hundreds of thousands of dollars on an RV that has such poor quality that no one is willing to stand behind or provide a 100% bumper to bumper warranty of the product design or manufacturing for more than a few months. I have offered and continue to offer to do a detailed inspection of failed tires and to issue an un-bias report of my findings but too often the most I get is a slightly out of focus and improperly lit photo of the subject tire with no DOT serial and documented loading and service speeds. 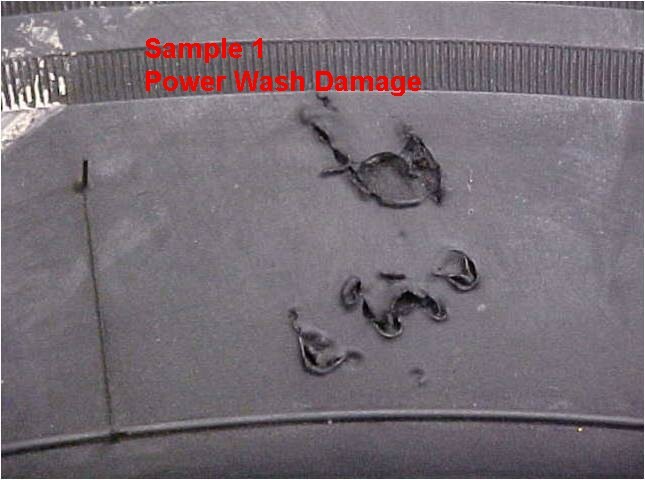 I will be offering, in future posts to my blog, examples and information on impacts and road hazards with photographs showing sidewall "bubbles" as well as proof of the tire being damaged in service. If you have questions about a suspect tire “defect” I will be happy to talk with you if you attend my Tire Basics for the RV Owner at FMCA Family Reunion in Madison, WI the end of August or the Gypsy Journal Rally in Celina, OH the end of Sept. Along with others who deal with tire questions, I too often incorrectly assume that the information on all placards is complete, correct and consistent and that the owner knows where to find this sticker. This incorrect assumption comes from looking primarily at car placards from vehicle manufacturers that have regulatory compliance engineers working for them. 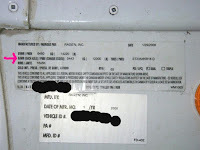 However, when it comes to the information on these labels for RVs, there have been significant changes in both the information that is included and the location for the placement of the sticker and it seems that not all RV manufacturers pay as much attention to the accuracy of the information on the placard as others. Do you know where your placard is located? Are you sure the information is both complete and correct? Over the past few years both the location of the sticker and the information requirements have been changed. 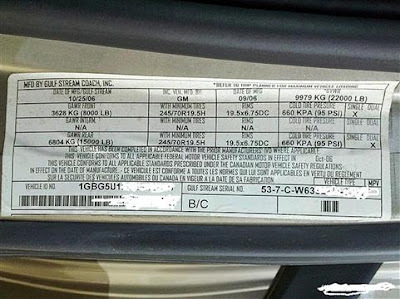 Newer Cars and Pick-ups will have a color sticker with this information. Note the lack of complete tire size on this older sticker with only the rim size identified. Newer Class A should have a placard at the driver's location. But may have more complete information in another location like a closet. This newer Super-C seems to have all the information the owner needs. Some owners will be lucky and have actual unloaded weights. Finally here is an example of a placard applied by a manufacturer that didn’t follow the requirements. Clearly the trailer does not have two 12,000 Lb axles running dual tires and the tire cannot carry 6,000 Lbs each. 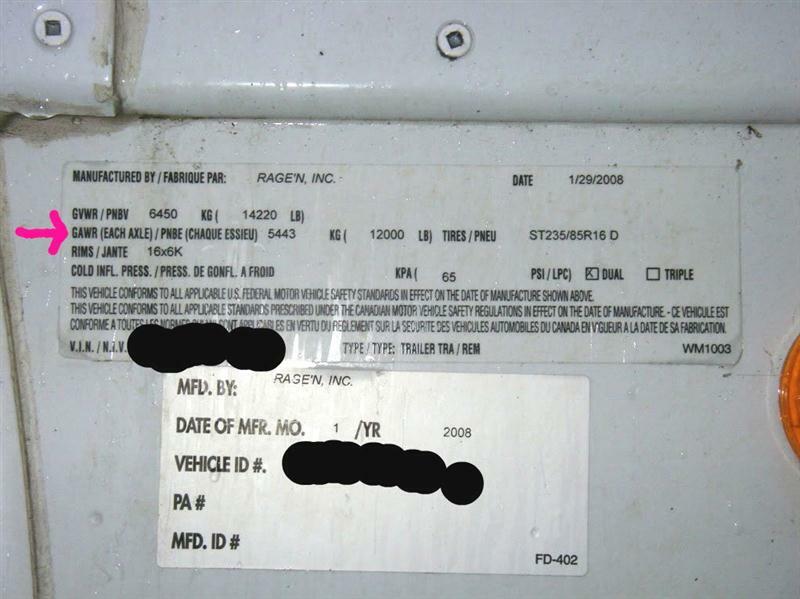 There might have been a recall if the trailer manufacturer was still in business. 1. Find and know the location for the placard for all your vehicles. 3. Confirm you have the same size and Load Range tires as identified on your placard. 4. If you find a difference or have a question snap a picture of your placard and send me an email with your questions –tireman9@gmail.com- and I will try and help sort out the questions you might have. Today's key fact: Check your tire pressure in the morning, before you drive and before the tire gets warmed by the sun. 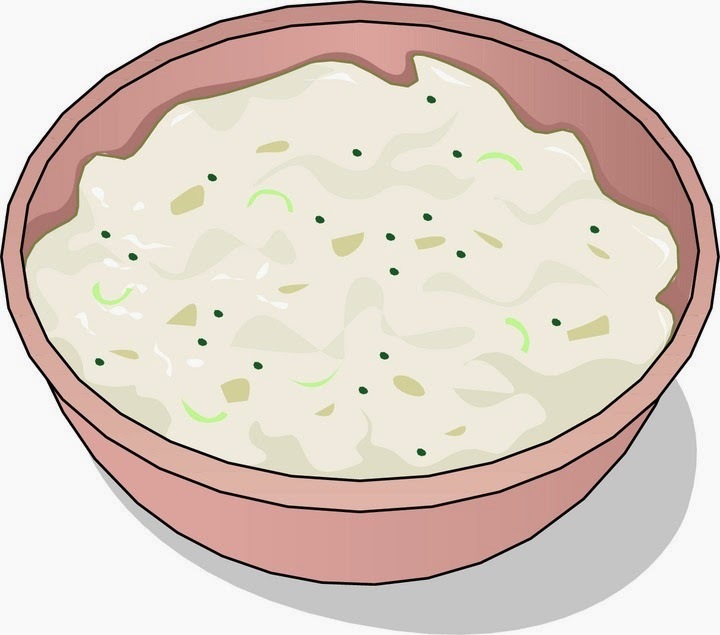 Now the background information for detail oriented. The general guide for checking tire inflation is to do it when the tire is "cold". In this case "cold" means the tire is at the same temperature as the air and not in direct sunlight as the sun can raise tire temperature by 10°F to 50°F. 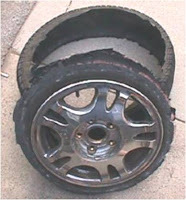 The tire also needs to cool down after being driven and the rule of thumb is to wait at least two hours after driving. Another rule of thumb relating to pressure change due to temperature change is that for a 10°F change in the temperature the pressure will change by 2% so for your big Class-A tires that means about 2 psi for each 10 degrees while on your passenger car you can figure about 1 psi for each 10 degrees. If you remember these numbers you don't need to do the math. All of these numbers are based on the "Ideal Gas Law" and the assumption that the tire does not change volume. Both of these assumptions are valid unless you are trying to measure tire pressure to the nearest 0.1 psi which even I didn't do on my race car. All this variation and "Rules of Thumb" are why I and others suggest you run your passenger tires (35 psi max) about +3psi, Your Light Truck tires ( 65 to 80 psi max) at + 5 psi and your Class-A size tires ( 100 - 120 psi max) at + 10 psi from recommended minimum. With these extra margins you don't have to worry about a few degrees temperature change or the one to three psi per month you will normally loose. If you want the mathimatical "proof" send me an email and I will be happy to reply. Are tire pressure monitoring systems “TPMS” worthwhile? The short answer in my opinion is YES. 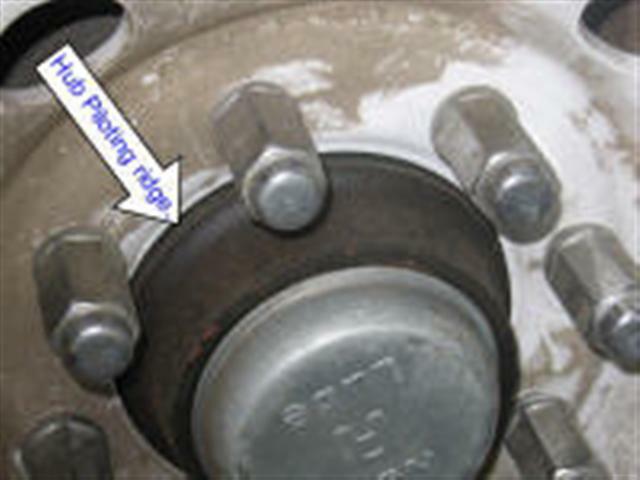 Since all Class-A and most Class-C and Class-B RVs exceed that load limit there is no TPMS required to be provided by the manufacturer new on these vehicles. It is up to the owner to select a system that will notify the driver if a tire looses a significant amount of inflation. Now some will say that they check their tires frequently. The reality is that even if you do check your inflation, with an accurate gauge, every morning before leaving a campground there is no way for you to know if you picked up a nail as you pulled out of the driveway. 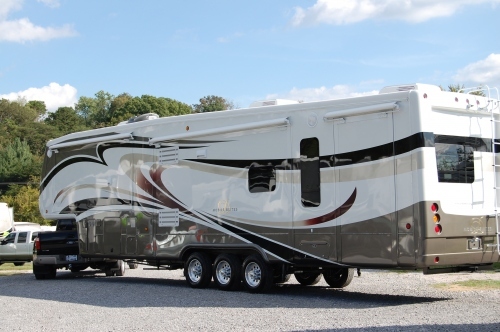 Given the significant cost associated with a tire failure on an RV what with body damage and possibly damage to one or more of your on-board utilities such as plumbing, generator etc. I consider a TPMS a good investment and it was one of the first items I added to my RV when I bought it. I am not in a position to recommend one system over another as I have not been able to do an evaluation of actual performance. There are aftermarket systems starting as low as $90 at TireRack.com. Doran Manufacturing, a long-time advertiser with RVtravel.com, has a comprehensive website with information about its system. Other four sensor systems run about $250 while many six to 10 tire systems for RVs can run in the $400 - $700 range. Simply Google Tire Pressure Monitor System and look for the application that fits your needs. Mark Polk wrote a nice piece on his experiences. I have seen a number of people post their experiences on some of the RV forums so I suggest you do some research before spending too much money only to discover the system you selected offered great marketing but maybe not the best hardware. One item I would be concerned with is the accuracy of any temperature reading with a sensor that screws on the end of the valve with a hose extender. I have not seen any data that identifies the temperature difference between the tire and the sensor, or if it is significant. I have looked into the subject and am only comfortable with sensors that bolt into the valve hole with the sensor internal to the tire. The bad news is this costs more to install. If you keep an eye on the inflation and continue to confirm the TPM sensor pressure matches your hand held digital gauge, I don't think you really need to worry about the temperature as the chance of loosing air at the rate that matches the increase of pressure due to increasing temperature of the remaining air is a low probability. If the sensor matches your digital gauge +/- 2 psi or less you are probably just fine. If you do have temperature readings I would get concerned if I saw a temperature reading exceed 170F assuming the sensor is accurate to +/- 5F or less. Bottom Line. I very strongly recommend all RV owners have some system of notifying the driver when a tire looses air. 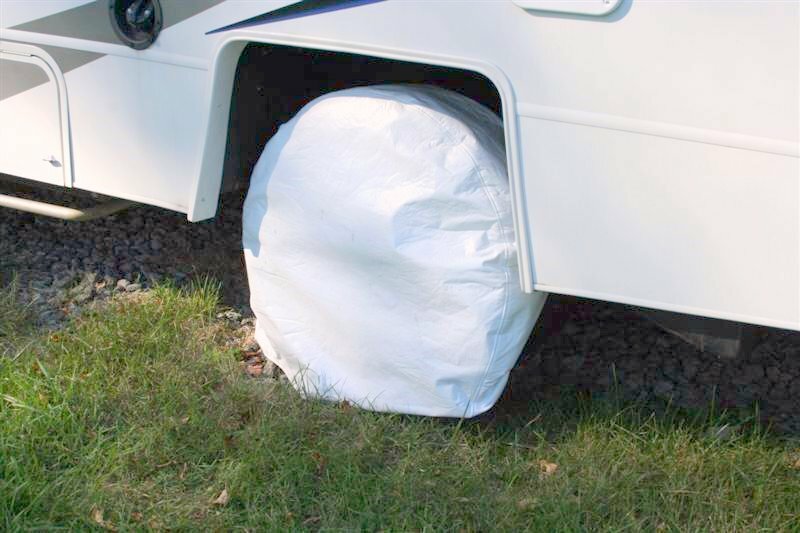 With the exception of a failure of the sidewall due to some damage, you will almost always get enough advance warning to save you the expense of damage to your RV. You might even be able to have the tire repaired if you stop soon enough and have not lost too much air and damaged the tire. Just one warning could pay for the system. Finally having a TPMS is not a substitute for checking your inflation before each trip. I have read of some people having the TPM sensor fail for as we know nothing is perfect. Better safe than sorry when it comes to having sufficient inflation to carry the load in your RV. In this series I am giving a lot of detailed technical stuff. For some of you this will make your eyes glaze over with boredom while others really want to know the “Why” of different tire selection. Please bear with me as I try and build a foundation of information that anyone can come back to later if they develop an interest or have a question. Last time we discussed “P-Metric” sizes. That means tires whose size begins with the letter “P” and have metric width dimensions. P235/75R15 the 235 is millimeters and the size starts with a P so that is a “P-metric” size. 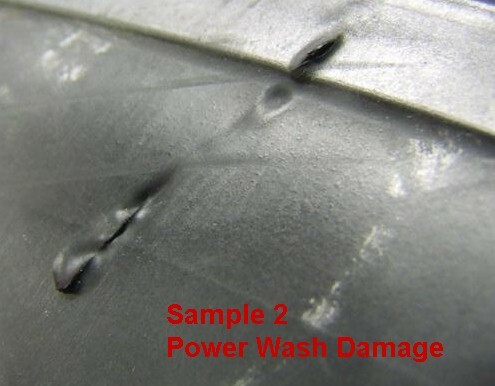 In the P-metric post we discussed a P235/75R16 105S which was rated at 2,028 Lbs at 35 psi max. Before we move to Light Truck tires where things get a bit more complex with multiple Load Ranges we need to finish up our discussion of Passenger tires. These are “Standard Load” tires with a max inflation of 35psi and “Extra Load” with a max inflation of 41 psi. Since most passenger tires are standard load, that is the default so few tires actually have the words “Standard Load” on the sidewall. However if the tire is rated for Extra Load it will have the words “Extra Load” and possibly “XL” on the sidewall in addition to the 41 psi max information. Originally Extra Load passenger tires were used on Station Wagons that some of us might even remember. In the 60’s there were regular passenger cars and Station Wagons. SUV’s, Crossover or other type vehicles really were not part of the market. 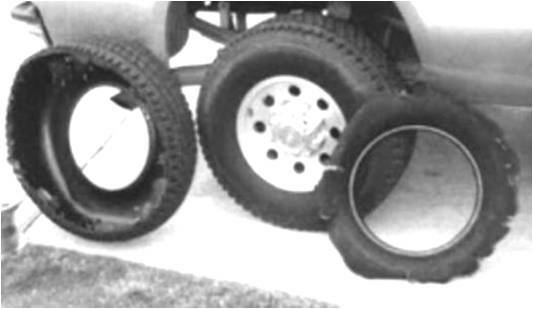 Since these larger vehicles were intended to be used with higher loads most of the time, it was soon discovered that there needed to be an adjustment when a tire was selected. Industry guidelines indicate that the vehicle normal load on the tire shall not be greater than 88% of the max load capability of the tire. Additionally if a P-metric tire is used on a “multi-purpose” passenger vehicle, think SUV etc or truck, bus or trailer, the load rating shall be reduced by dividing by 1.10. The total load capability at the recommended inflation shall not be less than the Gross Axle Weight Rating or GAWR. I guess you can see that things get a bit involved for the engineers at car manufacturers when they try and select an appropriate tire size and inflation. 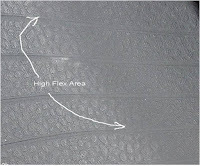 Extra Load rated tires are one option used by the engineers when selecting tire size. In our example size P235/75R15 108S XL we can carry an additional 308 Lbs on each axle at max inflation. If your tire placard or owner’s manual indicate your vehicle should use P-metric XL tires then that is what you should use. I’ve got a short list of reader questions to answer, then we can move on to other type tires that many will find on their Pick-Up, Trailer or RV. What do all those letters mean in the tire size? While I really want to help you get the information and answer you seek, I do not want to guess what tire you have as I may guess wrong and give you incorrect information. The reality is that the numbers alone are not all the information we need. To help us do a better job of answering your questions, you can help us by giving us the needed details. Here are some examples of how you can help us all if you provide complete size information when you ask a question. A P235/75R15 105S is rated at 2,028 Lbs at 35 psi maximum. This would be a “Standard Load” tire, while a P235/75R15 108S XL or Extra Load is rated at 2,183 Lbs at 41 psi max. We can break down the different parts of the complete size designation as follows. The P stands for Passenger. The 235 is the width of the tire in millimeters and the 75 is the Aspect Ratio of how tall a tire is relative to how wide. In practical terms it is how close the wheel is to the road. The “R” of course stands for Radial and if the tire were Bias as tires were before the introduction of Radials it would have a D for Diagonal. Don’t ask me why they didn’t choose the letter B. I have no idea. We all know the 15 is the rim diameter. The 105 or 108 is the Load Index. You can consider any passenger tire to be Standard Load unless marked “XL” or “Extra Load”. The “S” in the size above is the speed or handling rating. Passenger tires are not rated for dual application. The combination of Load Index and the Speed rating make up the Service Description. When you ask a question about a tire don't worry about what all the letters and numbers mean just look at your tire and copy all of the information and leave it up to me and other tire engineers to decipher the mumbo-jumbo. If you tell us your tire size is a P285/35ZR19 87Y we will know this ultra wide, very low aspect ratio large rim tire with a high speed rating indicates you are driving a Corvette and that those tires are not meant to be used on your RV. Next time we can move on to other type tires that many will find on their Pick-Up, Trailer or RV.